If you are thinking about updating the literacy system in your school or you have just invested in Fountas & Pinnell Classroom™ and you’re wondering where to begin, it's important to take the time to come up with an action plan. Luckily, we've come up with 4 easy steps to putting your vision of a coherent literacy system into action with this user friendly Interactive Action Plan! 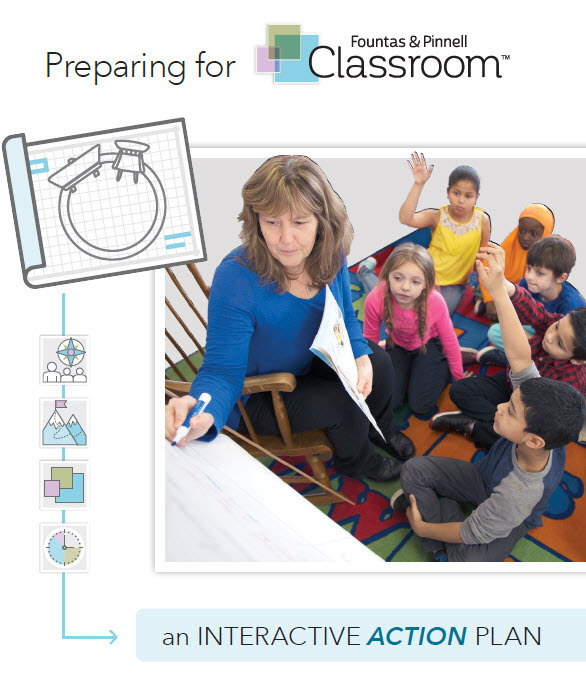 You can find the complete, printable version of the Interactive Action Plan for Fountas & Pinnell Classroom™ (FPC) HERE. Below is a short breakdown of this plan and how to use it to get started! In Step 1 of the Interactive Action Plan, you will define and record your values and goals. Defining your values establishes a foundation upon which to build your instructional priorities and instructional plan. You will first review and reflect on Fountas and Pinnell’s Core Values. You might find that you share the same values or perhaps you might want to use them to guide the decisions you make. Then you will take time to envision and name the values you have for literacy instruction in your own classroom. Let your core values established in Step 1 form the backbone of your decisions and lead you to set instructional goals that reinforce those values. In Step 2 from the Interactive Action Plan, you’ll have the opportunity to identify and prioritize your implementation and instructional goals through a self-assessment of your current literacy instruction. Use Step 3 in the Interactive Action Plan to get to know FPC and get familiar with all of the instructional contexts that are in the system. Here, is where you would also take the time to get familiar with The Fountas & Pinnell Literacy Continuum, which is the instructional anchor for every goal, book, and lesson in FPC. The Literacy Continuum is a mandatory tool for being able to implement this system effectively, so it’s critical to get to know it as much as you can. Here is a link to a Study Guide if you’re not sure where to start. In this step, you will also map out an implementation plan, as well as identify professional learning needs and opportunities. Time for literacy is critical, but finding time to fit it all in can be a challenge. It will help to create a literacy schedule in advance, which is what you will do in Step 4 of the Interactive Action Plan. You will plan a week (or weeks) in your Fountas & Pinnell Classroom™ using examples to get you started. Thoughtful and intentional planning is needed to ensure efficient, engaging, and effective literacy opportunities in your classroom. This Interactive Action Plan is sure to prepare you for the implementation of this exciting new literacy system. But Fountas & Pinnell Classroom™ is not just a literacy system, it is a journey—a journey that will transform your classroom, your teaching, and the literacy lives of your students. So congratulations on the journey ahead!